It is important for any real estate business to have a website. It is an easy and effective way to present your properties and services. And this is why our developers made a Charles Flynn HTML Template. This simple, yet fully functional website will be your online business card. It is bright, clean and develops the atmosphere of trust. 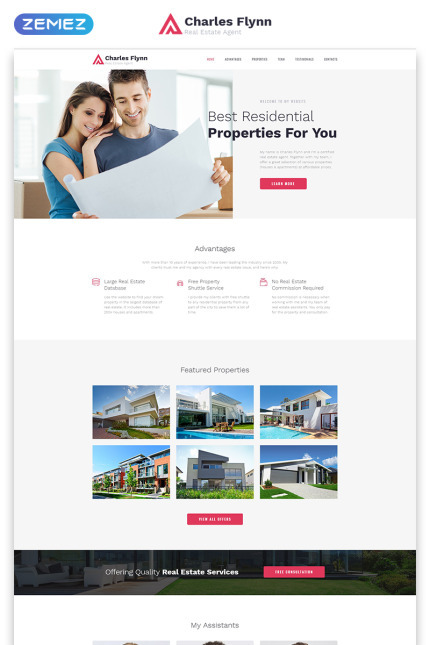 With this website template, you can present your team, properties and explain why clients have to choose your services. You can also gather and present feedback with testimonials. Charles Flynn supports high-quality images and includes eye-catchy effects and elements. Just check the product page and you will see how good it is.